Millennials are those born between 1980-2000, today between the ages of 15-35. This post is about millennials – why they are changing the game, how to hire them, and how to keep them motivated. The data presented below comes from Mary Meeker’s “Internet Trends Report” – one of the reports I look forward to each year. Kudos to Mary and Kleiner Perkins for this awesome data. This is my analysis of what it all means. No matter what Internet-related business you’re in, millennials are your most important demographic. Understanding how they think is critical. It’s an understatement to say that the world they’ve grown up in is dramatically different than Gen X (born 1965 – 1980) and Baby Boomers (born 1946 – 1964). 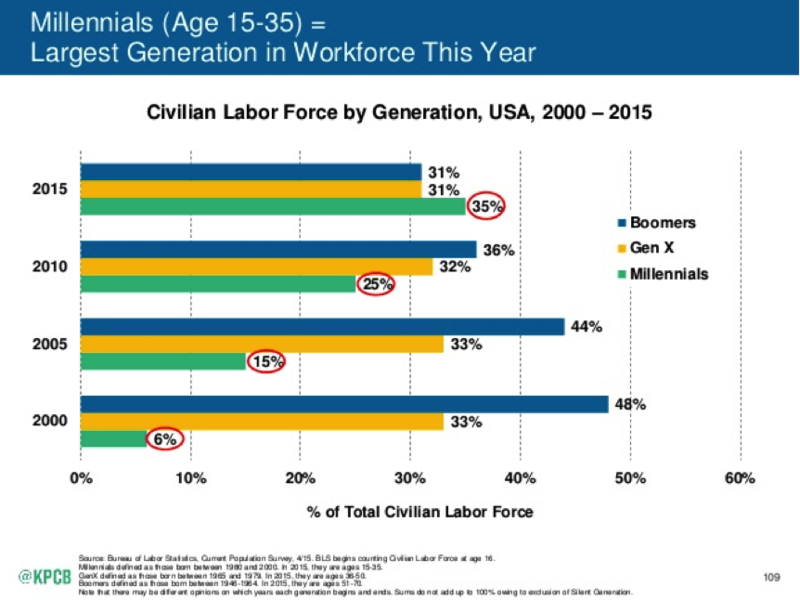 This year, they became the largest generation in the workforce. And I would posit that their workforce is still largely misunderstood – and immensely undervalued. I personally have a team of 5 millennials that is doing amazing things – they are more flexible, motivated, creative, and hard-working than most. If you want to tap into the millennial talent pool and keep them on your team, you have to adapt to their new modes of thinking. 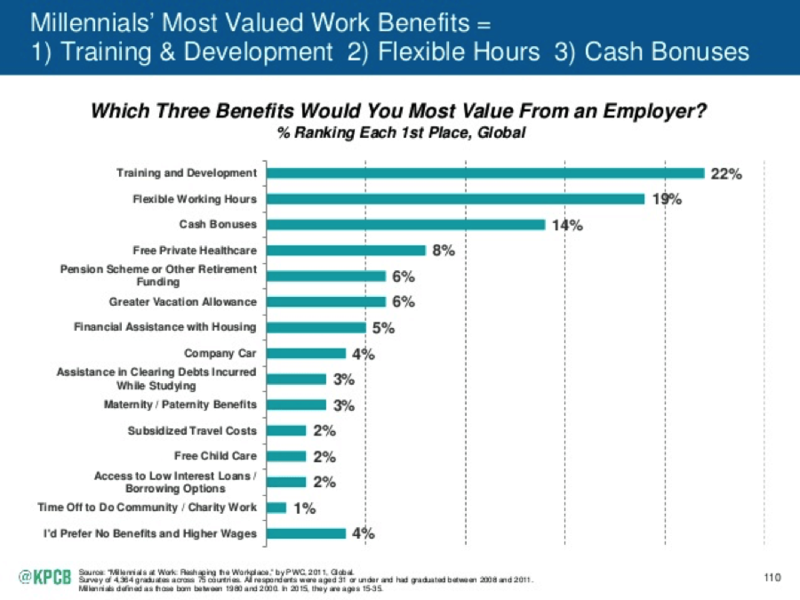 A cohort of 4,000 graduates under the age of 31, from around the world, were asked the question: which three benefits would you most value from an employer? Empowered by a world connected by technology, millennials have new tools and capabilities at their disposal. Many of the tasks we had to do at work have been digitized, dematerialized, demonetized, and democratized – and the people in this generation know how to leverage these exponential tools to do things faster, better, and more effectively than their predecessors. As such, they crave flexibility. They expect to be mobile and work from home/office/cafes/etc at their will. 32% believe they will be working ‘mainly flexible hours’ in the future. 38% are freelancing, versus 32% of those over the age of 35. ~20% identify as ‘night owls,’ and often prefer to work outside of normal business hours. 34% prefer to collaborate online at work, as opposed to in-person or via phone. 45% use personal smartphones for work purposes (vs. 18% for older generations). 41% are likely to download applications to use for work purposes in the next 12 months and use their own money to pay for them. As I’ve mentioned in a previous post, this year, the “on-demand” economy (think companies like Uber, AirBnb, Instacart, etc.) has exploded. According to venture capital research firm CB Insights, funding for on-demand companies jumped 514 percent last year to $4.12 billion. New investments in early 2015 have totaled at least $3.78 billion. 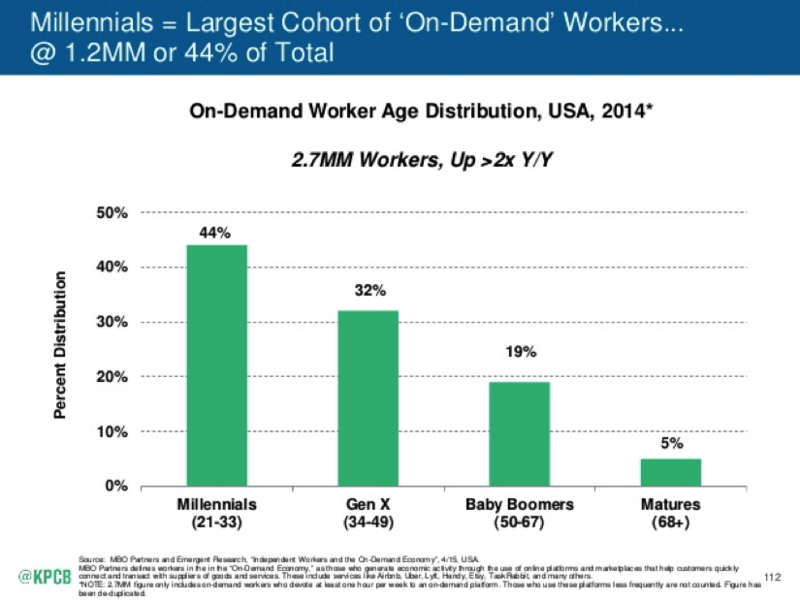 And, as it also turns out, millennials make up the largest cohort of “on-demand” workers. This isn’t a coincidence – it is largely reflective of their different mindsets. Getting things “on-demand” – what they want, when they want, where they want, how they want – is indicative of their priorities. 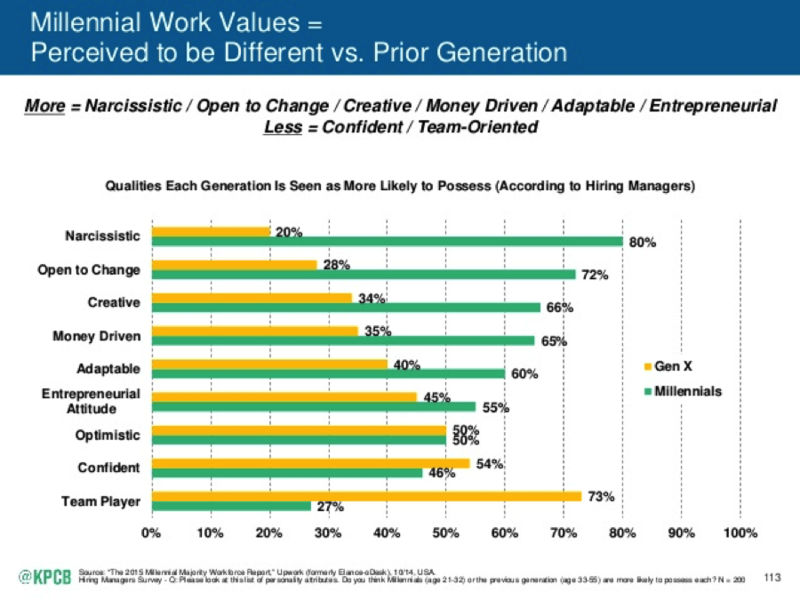 Look at the chart below: Hiring managers ranked qualities each generation is more likely to possess. The results: Millennials are significantly more narcissistic (more on this later), open to change, creative, money driven, adaptable, and entrepreneurial than other generations. There is a perception disconnect between managers and millennials – and it is making it difficult for companies with “older” cultures to attract and retain the best talent out there. The Career Advisory board did another study to compare the difference between managers’ and millennials’ views of the most important factors that indicate career success to millennials. 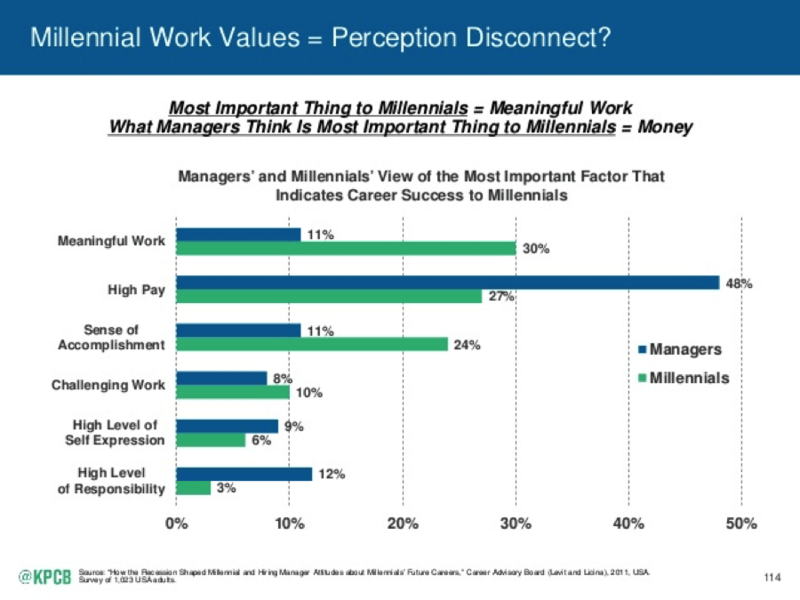 Most managers (48%) thought that MONEY was the most important thing to millennials. What did the millennials want most? MEANINGFUL WORK. This is consistent with my experience with the many millennial entrepreneurs and colleagues I work with, advise, invest in and support. Here are a few tips I’ve found useful in how to hire and retain great millennials. Give them the freedom/autonomy to work the way they want to work. In my mind (and this depends largely on the job/company), if the millennials on my team have a laptop and an Internet connection, they can be working. Some of them work best at 11 p.m. Some of them want to work and travel at the same time (telepresence robots like the BEAM make working remotely a breeze, and VR will make it even easier down the line). The notion of a 9-to-5 workweek isn’t attractive to them. Instead, be clear about milestones and deadlines and let your team accomplish them as they see fit. Have a massively transformative purpose (MTP). Millennials are mission-driven. The brightest, most hard-working of them want to change the world. You need to think 10x bigger and catalyze innovation in your organization by finding a massively transformative purpose that your team can rally around. 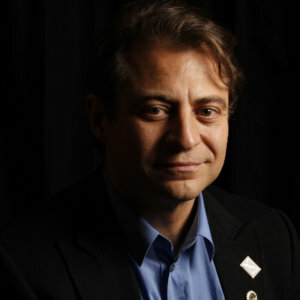 Think about Elon Musk’s MTP: to go to Mars and make humanity an interplanetary species. Or Google’s: to organize the world’s information. Millennials will flock to you if you have a compelling MTP and if your organization isn’t afraid to take moonshots. Align the incentives. If millennials have “upside” in the value that they create, they are going to work harder, faster and better than if a) they don’t have upside, or b) their upside isn’t clear. The game these days is all about incentives. Profit-sharing, prizes, status, gamification and friendly competition are all highly motivating to this group. Leverage these strategies to get the best work out of your team. My goal is to give them extraordinary upside based on their extraordinary results. Challenge them. Millennials love a good challenge. You saw in the results above that they are more narcissistic and perhaps egotistical than previous generations. Use this in your favor. Give them the authority and autonomy to challenge you. Let them prove why their particular solution is better than yours. They are also more creative and entrepreneurial than past generations, so you might be, in the very least, surprised by the results you get. Encourage them to experiment with exponential technologies. If they think they can optimize a process by using a new tech platform, say yes! Encourage them to leverage crowdsourcing, crowdfunding, machine learning/data mining, robotics/telepresence, VR/AR, etc. All of these experiments, if they work, will make your business more scalable, less expensive, and more fun. The proof is in the pudding. This most excellent blog was drafted by Cody on my team (a superstar at age 24) at 10 p.m. on a Saturday night, passed to me to edit, then to my other rockstars Marissa and Kelley at 11 p.m. for a final edit and to get out to you. I love my millennial team for their brilliance and dedication.